While it's great to go out walking for the day, sometimes you feel the need to explore an area in more depth. 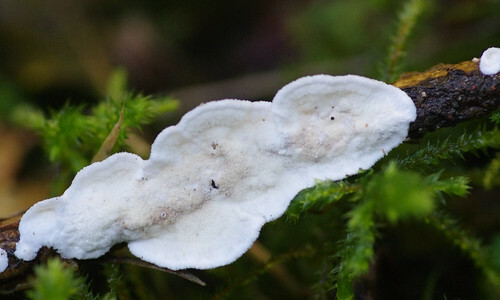 Dartmoor provides enough intrigue and a variety of biological mysteries to always keep us occupied. William Crossing spent a lifetime exploring Dartmoor and probably got to know all aspects of the moor better than any other human being had or ever will. In a modest way we have been attempting to follow in his illustrious footsteps, albeit on a part-time basis. This is one of the reasons why we head to Budleigh Farm for a few days, at least once every year. 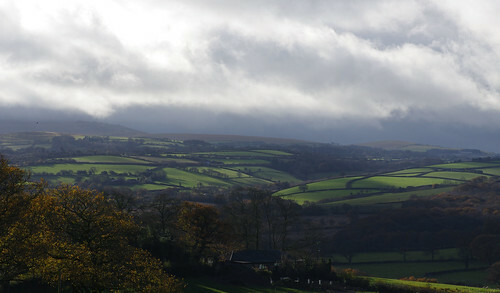 Budleigh Farm lies just outside Moretonhampstead and is ideal for a base from which to explore. And staying away from home means you can be out for longer, without having to worry so much about the journey home. The Moreton area of Dartmoor (roughly the North East corner) may not grab all the headlines but it has repeatedly given us many experiences and memories to cherish. And still it seems we have hardly dented the surface. There are so many places left to explore we are literally spoilt for choice. Sometimes our destination has been decided at random. At others we have been given a helping hand. In the cottage where we are staying, there is a fascinating book about villages in the U.K. I read through the section on villages in the South West and came across the entry for South Tawton, a village only a few miles away and far too close to bypass. On a morning when the sun deemed to grace us with its presence, we began our odyssey in nearby South Zeal. 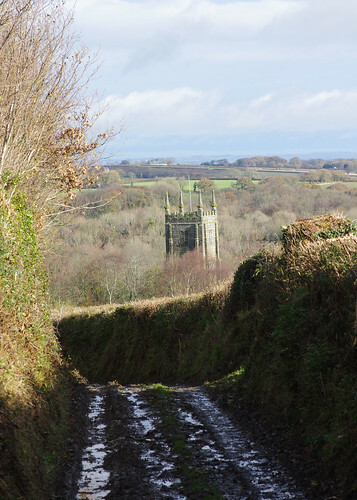 We walked along the main street and up the hill, heading towards Sticklepath, before turning off and lumbering up a rocky and ancient-looking bridlepath (also a section of the Tarka Trail.) On the way, we saw a redwing, eagerly eyeing the best holly berries. Redwings and fieldfares have a voracious appetite for berries but they are also easily spooked and you have to approach them cautiously. At the bottom we were in the village proper and able to marvel at the restored brewing house. 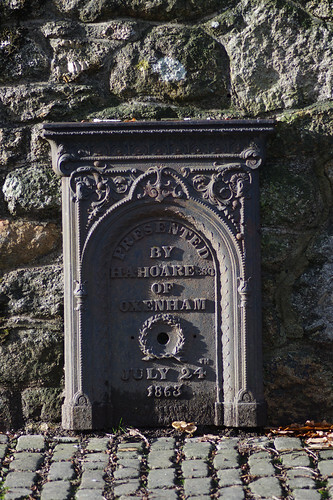 I had always supposed that the large number of Church House Inns were due to labourers, masons, architects and anyone else connected with the building of a church needing somewhere to stay and quench their thirst after a long day's work. South Tawton merits an entry in the book of best British villages because centuries ago the brewing house was instigated by the church to raise funds for a new roof. Unfortunately, on the day of our visit it was closed to members of the public (and their muddy collies) but occasionally it does open in the summer months for cream teas. I'm not sure if they are licensed to serve anything stronger but we will be returning in the near future to find out. This commemorative piece piqued our interest. Take away the middle inscription and it could be an ornate fireplace. We continued through the village, taking the left fork at the next junction. The road led on past the northern border of the national park, to a bridge over the A30. But in a matter of minutes we had left the traffic behind. 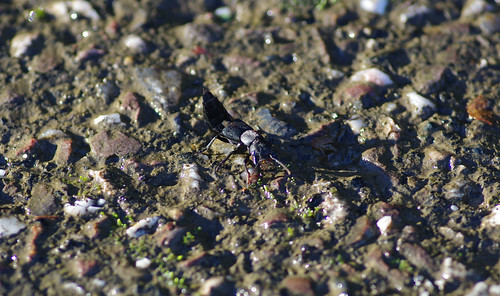 It's not often you see beetles mating well into November. 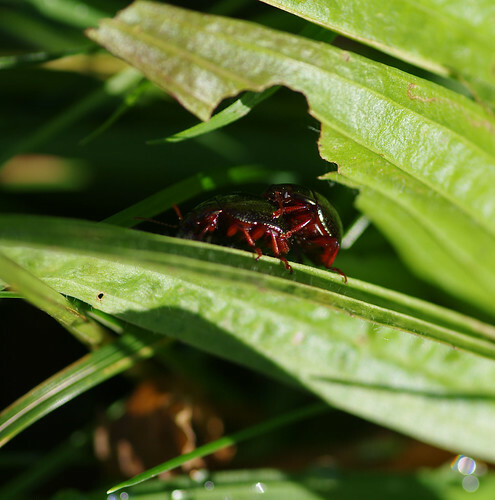 This is a leaf beetle species. The plantain leaf might have supplied their breakfast that morning. A common but nonetheless impressive species. This one arched its back and head simultaneously when crossing the road. Just before a tractor passed, Sherry helped it to the other side. This was by the roadside in the hamlet of Taw Green. 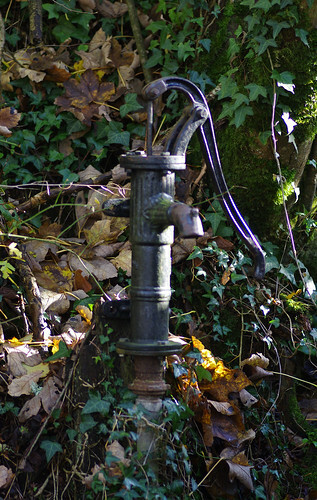 It's always gratifying to see an old pump. They provide a glimpse of a different world, when necessities we take for granted had to be worked. I can't help wondering who the last person to use the pump was and what was going through their mind at the time. Were they aware of the fact? What recollections might this awareness have prompted? Along the way we saw strings of berries with heart-shaped leaves, draped like vines or tangled like twine. There were pink spindle fruits and Lesser Periwinkles still in flower. We ascended another hill and, at Wyke Moor Cross, we turned for the homeward leg. The clouds chased each other and made shadow trails over the rolling hills and out of sight. 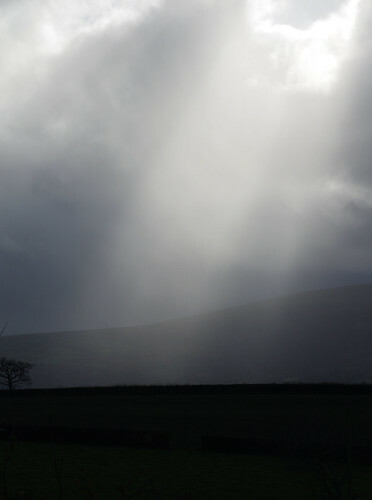 We watched these rays glide across the landscape and Sherry snapped away, hoping each image would reflect the experience. 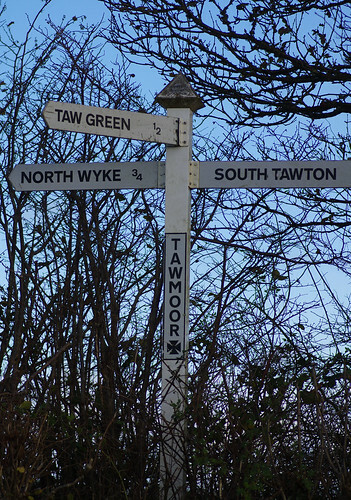 Each of the three places seemed equally enticing but back to South Tawton was the most logical choice. But how exactly? By the long or the short way? At Spitlar Cross, we plumped straight ahead. The signs were encouraging at first. 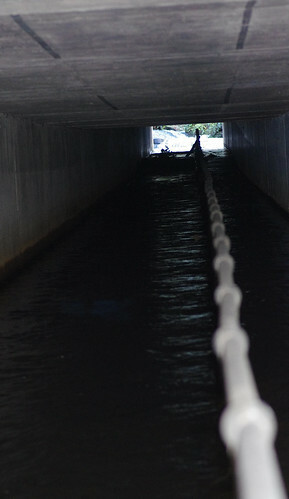 Lady is sometimes used as a depth gauge but in this case she refused. And if she chooses not to go then we definitely won't go on to prove a point. So we trudged back up the lane and headed left instead. 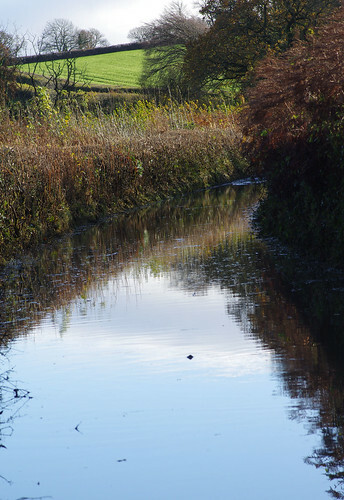 At the bottom of the next hill, I saw an inviting little wood and refused to heed the mental warnings; warnings that declared: if it was flooded back up there it's bound to be flooded along here, as well. 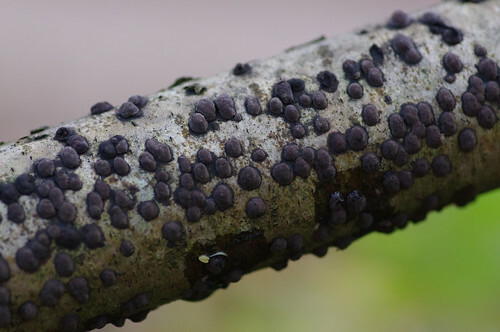 This looks very similar to Beech Woodwart (black and spotted fungi also on round branches and twigs.) But this was definitely a hazel. 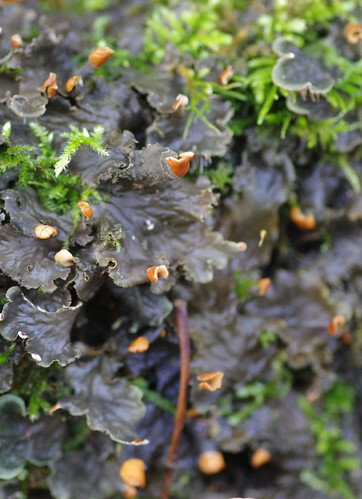 Looking at the ends of Peltigera lichens is simetimes enough to distinguish them. This species has orange, curved fingernail-type projections. A sign had already informed us of the fact but we just had to take a quick peek just to see how bad things really were before doubling back. This one had me stumped and I have still not found the answer anywhere. 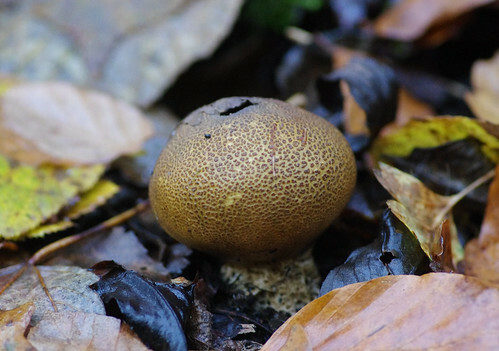 Earthballs shoot spores from the hole in the top. They are dark and powdery in the middle if cut open and are inedible. At the end of the wood (and thankfully third time lucky) we went left up the hill. At the top, we rejoined the road going over the A30. But before we turned off there were more mysteries to investigate. This starts out as scattered red spots on the leaves then spreads and intensifies. 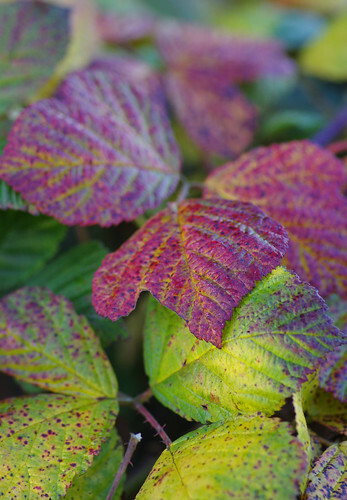 Until I discovered this one evening by accident I thought bramble leaves changed their hues in autumn as a natural response, just like the trees. 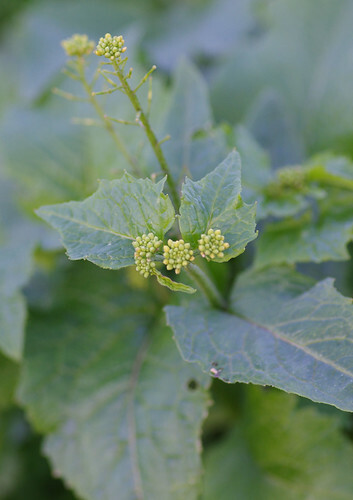 This plant resembles Charlock and Black Mustard and could possibly be a hybrid of both species. We found this Ichneumon Wasp on one of the crucifers just inside the road. It was close to a sign about biodiversity in organically farmed fields. Here was the evidence right before our eyes! This is quite a rare species or perhaps it has just been under-recorded. 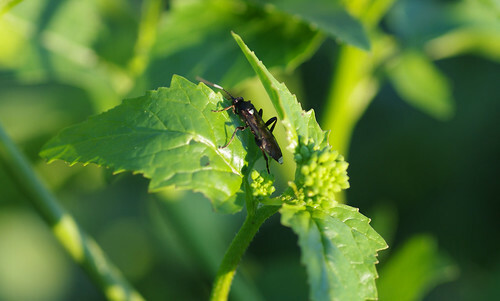 Ichneumon wasps do not sting but they have another deadly weapon. The females lay their eggs on insects. The wasp larvae grow inside and literally eat their way out, killing their host. I admit I did not see the appeal of the image above. It's just another line of trees, I thought, as the light faded rapidly; concerned we might be stumbling our way through the final stretch in the dark. But in the end we made it back to South Zeal in good time. 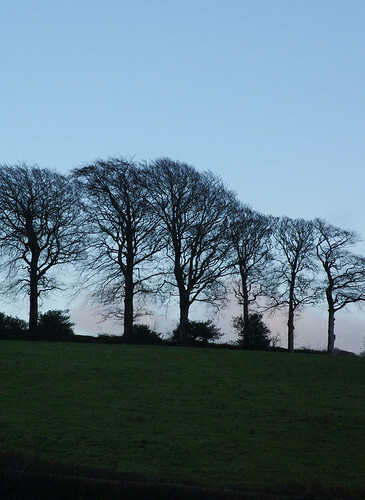 The windblown boughs came out fine and I found myself eating humble pie. With our thanks to Jane Redman for agreeing to join us on this odyssey.